An intriguing object has been found in one of the spiral arms of the galaxy NGC 2276. This source, called NGC 2276-3c, appears to be an intermediate-mass black hole. According to X-ray and radio data, NGC 2276-3c contains about 50,000 times the mass of the Sun. A newly discovered object in the galaxy NGC 2276 may prove to be an important black hole that helps fill in the evolutionary story of these exotic objects, as described in our latest press release. The main image in this graphic contains a composite image of NGC 2766 that includes X-rays from NASA's Chandra X-ray Observatory (pink) combined with optical data from the Hubble Space Telescope and the Digitized Sky Survey (red, green and blue). The inset is a zoom into the interesting source that lies in one of the galaxy's spiral arms. This object, called NGC 2276-3c, is seen in radio waves (red) in observations from the European Very Long Baseline Interferometry Network, or EVN. Astronomers have combined the X-ray and radio data to determine that NGC 2766-3c is likely an intermediate-mass black hole (IMBH). As the name suggests, IMBHs are black holes that are larger than stellar-mass black holes that contain about five to thirty times the mass of the Sun, but smaller than supermassive black holes that are millions or even billions of solar masses. The researchers estimated the mass of NGC 2766-3c using a well-known relationship between how bright the source is in radio and X-rays, and the mass of the black hole. 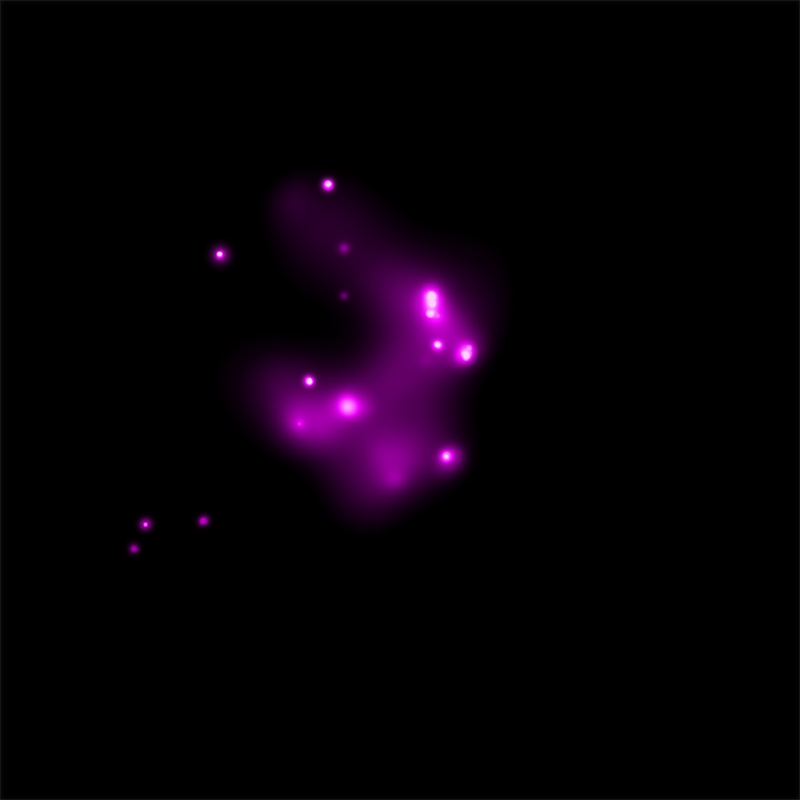 The X-ray and radio brightness were based on observations with Chandra and the EVN. They found that NGC 2276-3c contains about 50,000 times the mass of the Sun. IMBHs are interesting to astronomers because they may be the seeds that eventually evolve into supermassive black holes. They also may be strongly influencing their environment. This latest result on NGC 2276-3c suggests that it may be suppressing the formation of new stars around it. The EVN radio data reveal an inner jet that extends about 6 light years from NGC 2276-3c. Additional observations by the NSF's Karl Jansky Very Large Array (VLA) show large-scale radio emission extending out to over 2,000 light years away from the source. A region along the jet extending to about 1,000 light years away from NGC 2766-3c is devoid of young stars. This might provide evidence that the jet has cleared out a cavity in the gas, preventing new stars from forming there. The VLA data also reveal a large population of stars at the edge of the radio emission from the jet. This enhanced star formation could take place either when the material swept out by the jet collides with dust and gas in between the stars in NGC 2276, or when triggered by the merger of NGC 2276 with a dwarf galaxy. In a separate study, Chandra observations of this galaxy have also been used to examine its rich population of ultraluminous X-ray sources (ULXs). 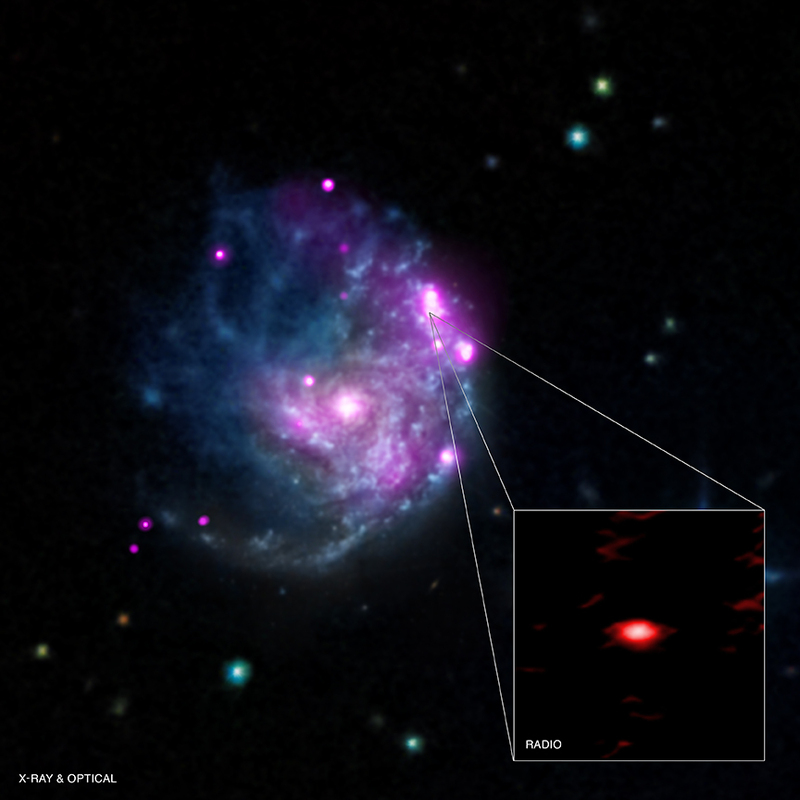 Sixteen X-ray sources are found in the deep Chandra dataset seen in this composite image, and eight of these are ULXs including NGC 2276-3c. Chandra observations show that one apparent ULX observed by ESA's XMM-Newton is actually five separate ULXs, including NGC 2276-3c. This ULX study shows that about five to fifteen solar masses worth of stars are forming each year in NGC 2276. This high rate of star formation may have been triggered by a collision with a dwarf galaxy, supporting the merger idea for the IMBH's origin. The study on NGC 2276-3c was conducted by Mar Mezcua (previously in the Instituto de Astrofisica de Canarias and now at the Harvard-Smithsonian Center for Astrophysics), Tim Roberts (University of Durham, UK), Andrei Lobanov ( Max Planck Institute for Radio Astronomy, Germany), and Andrew Sutton (University of Durham) and will appear in the Monthly Notices of the Royal Astronomical Society (MNRAS). A separate paper on the ULX population in NGC 2276 will also appear in MNRAS and the authors on that study are Anna Wolter (National Institute for Astrophysics (INAF) in Milan, Italy), Paolo Esposito (INAF), Michela Mapelli (INAF, Padova), Fabio Pizzolato (University of Milan, Italy), and Emanuele Ripamonti (University of Padova, Italy). Coordinates (J2000) RA 07h 27m 14.48s | Dec +85° 45´ 16.20"
Observation Time 19 hours 30 min. It's interesting to know of such stuff and comforting to know that no black hole is close by to swallow our planet. A galaxy about 100 million light years away with an intermediate-mass black hole in one of its spiral arms. About 100 million light years from Earth. X-rays from Chandra, optical data from the Hubble Space Telescope and radio waves from the European Very Long Baseline Interferometry Network. About 140,000 light years across. X-rays in pink, optical red, green and blue and radio red.